← How to Setup Your Magicjack Voicemail? Gmail has been seeing some exciting improvements quicker than ever after the advent of Gmail Labs. The latest being the ability to access Gmail offline even after you have lost your Internet connection! Gmail Labs was a new feature introduced in Gmail a few months back. It follows the same lifecycle as most Google products which are introduced via Google Labs and then mature as a full featured public versions. 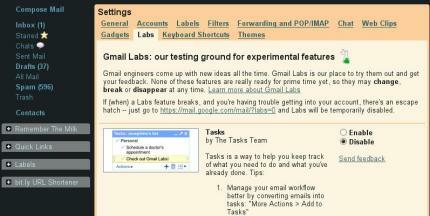 Gmail Labs is where the experimental features in Gmail make their debut. Gmail users can enable/disable any of these features from Settings -> Labs tab in Gmail. At present, there are around 33+ experimental features that you can enable in your Gmail account. Of all the features, the one introduced today – Offline mode, is the most valuable to those on the move or with spotty Internet connection. Offline Gmail uses Google Gears technology to download a local cache of your mail. I usually have a sturdy Internet connection at home and work. So, this is a feature that I won’t be using as much but I can see how useful this could be so useful for those with flaky Internet connections. Offline Gmail is an experimental feature. So, expect to see bugs but I have to admit most of the Gmail Labs’ features just work fine for me. Default Reply to all – I so often forget to use the ‘Reply to all’ when I am replying to a group message. Custom Label Colors – I have around 2 dozen labels colored different! SMS in Chat – I have started to use this so often as its faster to type a SMS message from Gchat than my phone. Add any gadget by URL – I have the Remember the Milk Gmail gadget added to my sidebar. beats using the Firefox extension. The Offline Gmail feature is supposedly being rolled out to US & UK Gmail accounts. But, I haven’t seen it in mine yet. While waiting for it to be enabled, check out some of the best Gmail Greasemonkey scripts that enhance your Gmail 2.0 functionality even more. If you have it enabled, share your experience with it in the comments. Gmail is becoming so innovative. I love it so much. Kinda weird that it took them this long to achieve this. This is an awesome new feature. I’ve actually developed a web app myself using Google gears and it worked great. thanks for given such impressive information about gmail really its very important for me. I really like the idea of being able to access my mail offline. It will be great to be able to compose messages and then when your connection comes back they get sent automatically I work at a place with an over air connection and the signal is always going away (I think it is when a bird flies by or something). Very good news… when I first signed up for Gmail I never imagined I’d depend on it as much as I do now for my emailing needs. Yet another example of why google is #1 (and deserves it). I like gmail, but like having a copy offline which is why I still use outlook… now it’ll be easier to think about dumping outlook like I dumped IE for firefox. This is good news. Thanks. Hey , thats great news, very interesting.. isn’t it.. Thanks for that great news.. very impressive post..
That is kind of cool. I live in the country so my high speed sometimes drops for 10 seconds or more now and then. Quite handy. Google is bringing everything online… why to get Gmail offline? It’s not making any sense to me! I really don’t think it’s the way to go in 2009. Looks like full of …. Why go offline when everything is going online? Gmail is going up day by day. I hope gmail has a bright future. Gmail chat is a great feature especially since they introduced the invisible function, so you can stay online even your in a meeting with work and you don’t get pestered, but can still see who is online. This is a really good development for Google Mail, now it’s taking it offline, you;ll be able to work on your email even when away from an internet connection, another step to providing people with part of a Google Operating System? I’ve not tested it yet, but this should work really well for me when going to a coffee shop that doesn’t have Internet access – so will stil be able to get stuff done! This is a really useful feature, thanks for pointing it out! This might just be the thing that makes me switch from Outlook. I’ll have to try it out tonight. Seriously, Google becomes a monster and has a potential to dominate any niche it steps in, especially in the IT field. What a improvements, do you remember few year ago where we were?? This has really done wonders for me, no more having to print emails when I am offline, good job google! I love Gmail. I used to use yahoo before but now i have totally switched over to Gmail. Thanks to google team for their innovative efforts towards google.. Excellent articles. Thanks for sharing.!! !